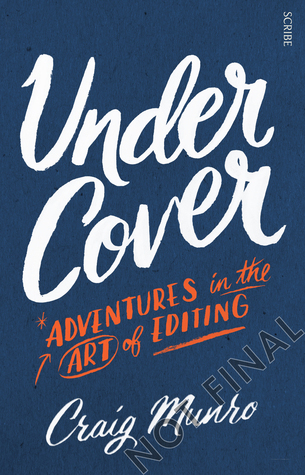 Under Cover, Adventures in the Art of Editing, by Craig Munro is a book that – as you’d expect since it’s been written by a book industry insider – has been widely reviewed by book industry insiders. (Here’s Geordie Williamson’s in The Australian and one on the ABC where the reviewer seems to know that ‘Craig is such a lovely man’.) But for me, reading the book as an outsider looking in, it’s perhaps a different experience. I didn’t have to worry about whether I featured in it! In 1970 UQP (the University of Queensland Press) began its transition from a traditional university press founded in 1948, with a poetry series called Paperback Poets (edited by Roger McDonald and featuring poets like Rodney Hall and David Malouf). It then branched out into literary fiction, and as the fiction editor from 1971 to 2005, Craig Munro brought us books by authors that are household names today. Even a quick look through my library shelves shows just how many authors are from the UQP list: Peter Carey, David Malouf, Katharine Susannah Prichard, Murray Bail, Thea Astley, Janette Turner Hospital, Kate Grenville, Beverley Farmer, Lily Brett, Olga Masters, Randolph Stow and Elizabeth Jolley. Some of these authors stayed loyal to the company and others moved on after getting their start, but there is little doubt in my mind that Munro was instrumental in guiding literary taste in Australia for over a quarter of a century. Goodness me, what a name-dropper I am in this post! But it’s the nature of books like this to drop names, tell chatty anecdotes, even gossip a bit. Some of the most revealing asides are a reminder of how times have changed since the days when an exchange of contracts took a week by mail, and Munro had to get permission from his boss to place a trunk call because they were so expensive. But what’s also different now is a different sort of corporate mentality, the rise of the literary agent who is another sort of ‘gatekeeper’ in the process of getting published, and of course the whole global industry, the rise of ePublishing and the self-published author. If you’re wondering whether this book will appeal to the general reader, my answer to that is to quote this passage about Olga Masters, that wonderfully talented ‘late bloomer’ who started writing at 62, and tragically died of cancer before she could realise her ambition to publish one book for each of her seven children. At the time I recommended Olga’s stories to UQP, I still knew very little about her. Only later did I discover that she was sixty-two years old and had grown up in poverty on the south coast of New South Wales. Her first job was with a local newspaper, The Cobargo Chronicle, whose editor had encouraged her writing ambitions. She had first begun writing fiction in the 1930s, aged just fifteen, making her even more precocious than Peter Carey. Married at twenty-one to a schoolteacher, she raised a family of seven children, continuing to work part-time as a journalist. For those of us who love Olga Masters’ books, it’s a privilege to read this kind of insider knowledge. It’s also good fun to learn that one of the judges in the year that Peter Carey missed out on the Booker was livid that her co-judges didn’t choose his book when she couldn’t make the final meeting due to theatrical commitments. So much for a confidential judging process, eh? Looking forward to reading this one, along with another ‘insider’ novel MUSE by Jonathan Galassi, Farrar, Straus and Giroux publisher. Love these books. Enjoyed Edward St Aubyn’s outrageously rollicking and wry Lost for Words as well (parody of a large UK-based literary prize the Man Booker.) Have you read that one? It’s a very quick read, deliciously naughty. And spent a lot of money too, I bet!